Release: Structural Solar LLC announced that it has completed two solar projects for the Town of Stafford CT in the fourth quarter, 2015. The steel and aluminum structures were completed under a subcontract with Encon Heating and Air Conditioning. The solar canopies were designed and fabricated by Structural Solar who also installed the foundations and erected the steel. The projects are prominently featured at Stafford Middle School and Stafford Town Hall. The architecturally enhanced solar carports feature design elements that complement the existing design of the school and Town Hall. In fact, according to the company’s president, Robert Pegnato, the Town Hall solar canopy design incorporated some iron truss work and bracing from the nearby 19th century train station as a means to thoughtfully integrate the modern structure, solar technology and even electric car charging stations with the rich history and existing architecture of the City. According to Pegnato, the solar canopies and design elements were inspired by town officials who insisted the new structures be consistent with the quality and character of the surrounding buildings in the area. He added the Town of Stafford, between solar and geothermal installations have a remarkable commitment to meeting their goal of becoming energy independent. 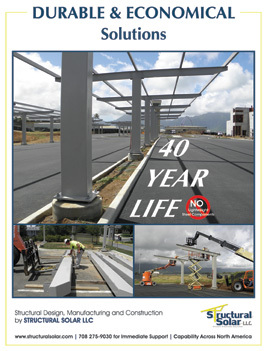 Structural Solar LLC designs, engineers and constructs specialty solar canopies across the Country including Hawaii.